Rough-legged Hawks (or Buzzards) don’t seem to generate much excitement here in northern North America. I suppose I know the reasons why — they’re common enough, and show up every year instead of in spectacular irruptions, and most birders probably associate them with wind-burn and frostbite and long, frustrating stares across snow-covered fields. 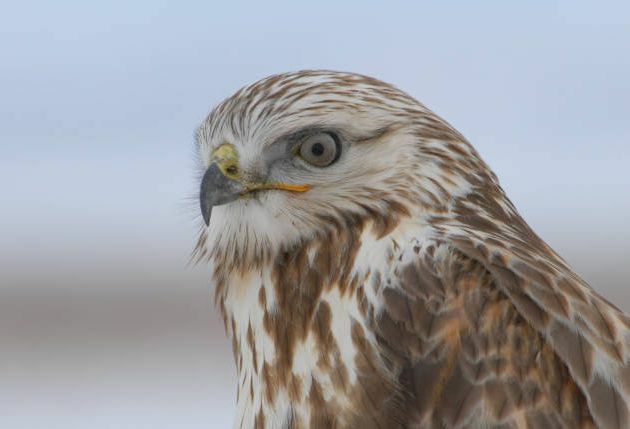 Nevertheless, I’d like to say a few words in praise of the Rough-legged Hawk. For one thing, like its Red-tailed cousin, this buteo offers a cornucopia of different color morphs to entertain and confused hawk-watchers. The pale form, with its dark belly, is a beautiful and distinctive bird, and the dark belly band is a field mark that the most amateur of birders can appreciate. The dark morph, like most dark hawks, is a noble-looking bird, almost intimidating. And maybe we should be intimidated, because when it comes to surviving the cold, these birds are tough. Tell them “winter is coming” and they’ll shrug and prepare to feast on your weak, summer-fed corpse. Their name, of course, comes from the fact that they grow a protective layer of feather down their legs for insulation. They spend the summer in the Arctic, nesting on cliffs, getting into skirmishes with Skuas, protecting their young from wolverines. When suitably-sized branches for fixing the nest are scarce, they sometimes use caribou bones. They spice up their vole-based diet with the occasional Snow Bunting or Ptarmigan or even a young, confused Short-eared Owl. Let’s face it, they’d probably eat the nose right off Chuck Norris’s face. So obviously they could destroy us all, especially when we’re weak and shivering in the open areas they favor for hunting, clutching our sad little steaming cups of coffee and huddling under woolly hats, barely able to raise our eyes to the isolated perches they favor without our lashes freezing together. And yet they do not. They are magnanimous lords of the winter fields, and don’t care at all about our folly in preferring flashy Snowy Owls or the mere rumors of Gyrfalcons, or even silly little snack-sized finches. Pray that they are always so tolerant. Carrie, poetic and a pleasure to read… thanks!! That was a brilliant way to start into Monday! Thanks for the chuckles!! Where Are You Birding This Third Weekend of May 2011?